Jay B. Lubliner, DMD provides porcelain dental veneers in Massapequa, NY. Call 516-798-0223 to learn more and schedule your appointment today. Call 516-798-0223 to schedule your appointment today. How long does the veneer process take? First, you will have a consultation with Dr. Lubliner, during which he will evaluate your smile and help you determine how many veneers are needed. After your initial consultation, veneers can be completed in as few as two appointments. At the first appointment, we will take impressions and prepare your teeth for the veneers. Dr. Lubliner will also hand-make temporary veneers for you to wear while you wait for the permanent ones. Patients often remark that Dr. Lubliner’s handmade temporaries look almost as good as the permanent ones. Your impressions are then sent to a professional dental lab where your permanent veneers are fabricated. At your next appointment, we will test your veneers to confirm that they are the correct color, shape, position, and size. If they are, we will permanently place them in your mouth. On the very rare occasion that there is a problem, we can send the veneers back to the lab to have changes made, and they will then be permanently placed at your next appointment. What is the difference between porcelain veneers and porcelain laminates? There is no difference. Both terms refer to thin porcelain shells that slip over your natural teeth. 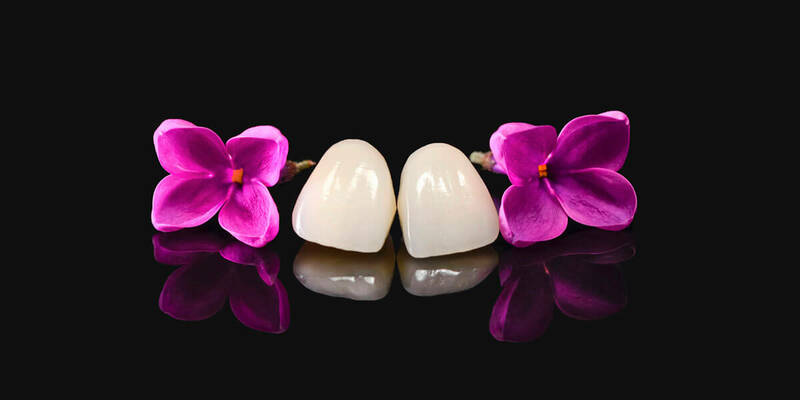 What is the difference between porcelain veneers and composite bonding? Porcelain veneers are created in a lab based on impressions of your teeth. They are a durable, long-term, stain-resistant solution that looks extremely natural. Composite bonding consists of placing stock material over your teeth and then shaping it by hand. Composite bonding is less expensive than porcelain veneers, and the initial results can appear very similar. However, the bonding material is not nearly as durable or stain-resistant as porcelain veneers. Over time, composite bonding can become stained, chipped, and generally worn out. Continually replacing old bonding costs more, and requires far more dental visits, than simply choosing porcelain veneers at the outset. What is involved in prepping my teeth for porcelain veneers? We will gently shave down a small amount of tooth material. This does not take long, and you will feel little or no discomfort. We preserve as much tooth structure as possible to minimize the risk for future issues with the veneered teeth. How many veneers should I get? Every person has a different smile, so the number of veneers you receive depends solely on your individual needs and desires. Dr. Lubliner will carefully assess your teeth and make a professional recommendation. Why choose veneers instead of simple tooth whitening? Tooth discoloration is caused by many factors, and some types of discoloration do not respond well to whitening. For example, teeth that have experienced trauma or root canals may not be receptive to whitening. Likewise, if you have stains from an overabundance of fluoride or exposure to certain antibiotics during tooth development, whitening may not be a solution. However, many people are able to have veneers placed only over the problem teeth, and have the rest of their teeth whitened to match. Dr. Lubliner will help you decide on the proper treatment for you. Ready to schedule your appointment? Call us today at 516-798-0223.